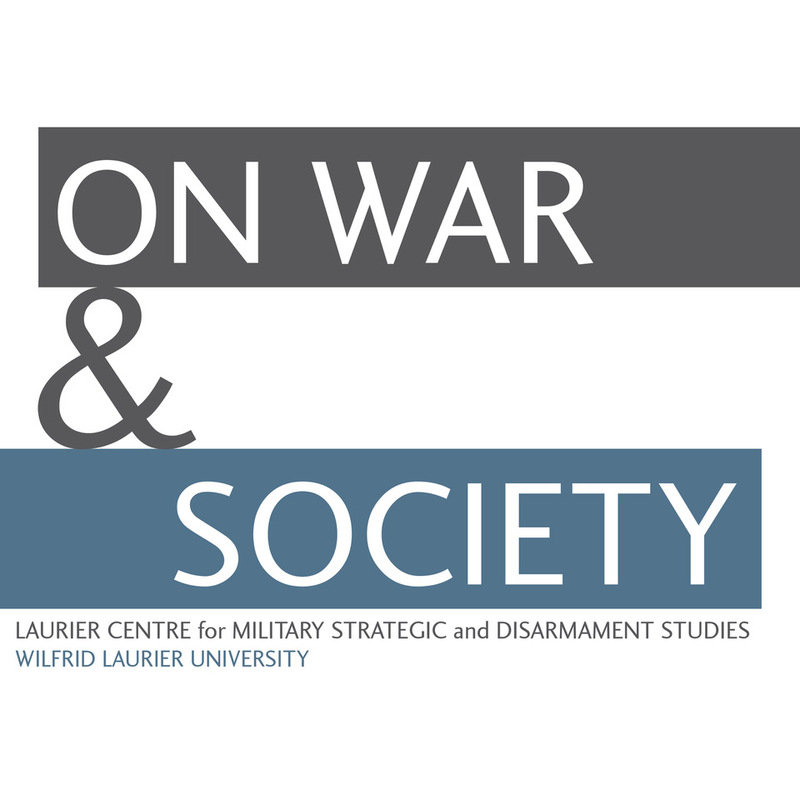 Brendan O’Driscoll is a student at Wilfrid Laurier University who participated in HI411, a history seminar that traveled to Russia last June. The following reflections are the final product of a ten day trip to Moscow and St. Petersburg with Dr. Leonard Friesen for HI411, a fourth year history seminar focused on the study of war and memory in Russia. As part of our time in each city, my fourteen colleagues and I explored each cityscape as a site of memory. This task included visiting iconic areas such as Red Square, but also locations little known to tourists, such as Russian cemeteries and war memorials. As the study of war and memory was familiar to me from my experiences during the previous year in Western Europe, I found myself making constant comparisons between the Canadian and Russian memorialization of war. As both these experiences have largely informed my understanding of war and memory in general, their comparison features prominently in this paper and has greatly influenced my conclusions. 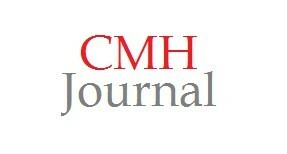 When I first began to consider the content of this paper, I started from the premise that societies memorialize their pasts with the present clearly in mind. They perpetuate themselves, and the values that they strive to uphold, through the creation and maintenance of a series of foundational myths. The physical manifestations of these myths are present in the granite and marble that are used to memorialize a particularly distinct or heroic past. In Canada – so we are told – our nation was forged on the slopes of Vimy Ridge where the Canadian Corps fought together for the very first time and accomplished a great victory that both the British and the French could not achieve. This has been immortalized in the Vimy Ridge memorial statue, a place of dazzling white stone and pilgrimage for Canadians to take pride in and share. A similar idea and message has been naturally extended to the Commonwealth cemeteries scattered across the face of Western Europe. Not surprisingly, the Russian experience and memory of war is understood and commemorated quite differently. Unlike Canadians who have experienced a consistently stable and singular message in their commemoration of the past, Russian commemoration, and therefore the values that it sought to perpetuate, was engendered by a system that no longer exists. Rather, as a result of the collapse of the Soviet Union, a number of messages appear to coexist, and sometimes compete for dominance in the memorialization of a complicated and politically sensitive past. In the following pages I reflect on some of my experiences with Russian memorialization and the ways in which it attempts to portray the past. I relate these experiences back to Western Europe and Canada wherever is it pertinent to do so. After being built to commemorate the Siege of Leningrad, Piskarevskoe Memorial Cemetery stands in a city that no longer exists. In 1991 the city renamed itself back to St. Petersburg, despite the deep connections that the name of Leningrad had for the memorialization of the city’s war experience. In 1941 the German army had quickly reached the outskirts of the city and promptly surrounded it in a 900 day siege. During this time, the population of the city lived through winters of starvation and the constant threat of bombing. Only later did successful counterattacks break the blockade and take the Red Army all the way to Berlin. These events are immortalized in the communal graves of soldiers and civilians that make up the 500,000 of Piskarevskoe’s fallen inhabitants. The city’s name change, however, indicates a political struggle over the places and experiences that a space like Piskarevskoe represents. 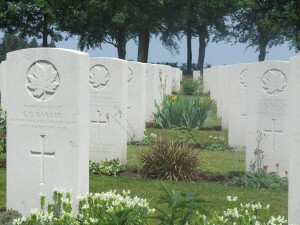 Canadian Tombstones at Etaples Military Cemetery in N. France. This phrase is iconic because it became the watchword for what Nina Tumarkin and others have called the Soviet War Cult, the public and organized veneration of a legendary wartime experience.But there is also a certain irony to this statement for Piskarevskoe itself, because the depth and tragedy of the cemetery is expressed through the expansive space of anonymous dead. This is in contrast to the great number of Commonwealth cemeteries where Canadian soldiers are buried. 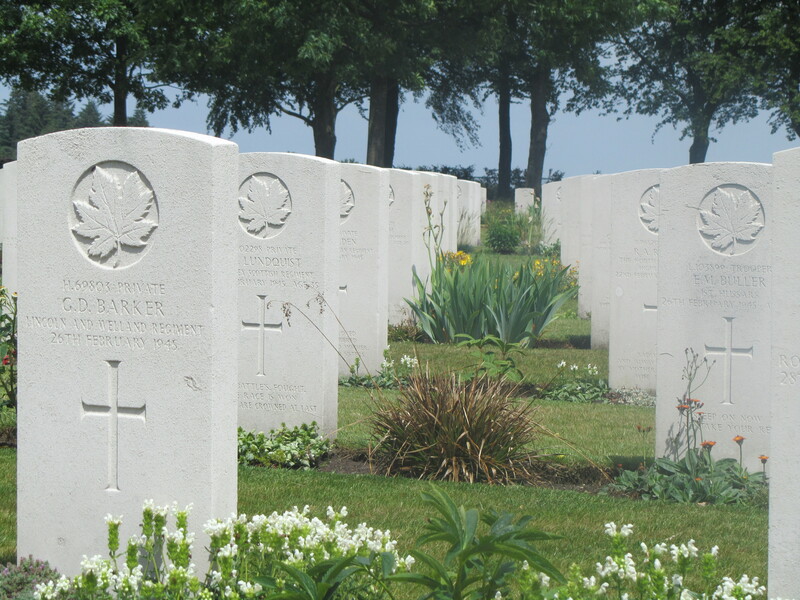 The Etaples Military Cemetery in Northern France, for example, holds over 10,000 Commonwealth burials which from afar, appear expansive and powerful. The dead, however, are indicated by singular individual tombstones which, upon approaching them, are named, have personal information, and are inscribed with unique epitaphs. Tragedy, therefore, is expressed through both the sheer number of uniform, yet individual graves, and the personal intimacy of each graves’ unique inscriptions. As a First World War cemetery, moreover, is differs very little in terms of themes and iconography from subsequent Second World War cemeteries. The two wars maintain a consistent message, and the Second World War, specifically, is seen as a natural extension of the First. 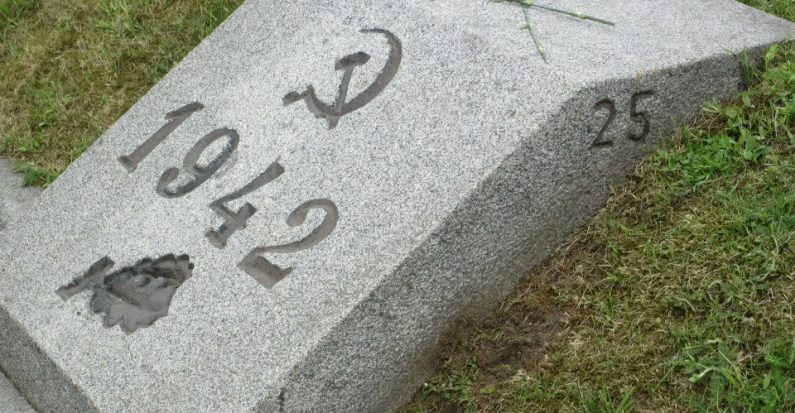 Russia is not influenced by the same sort of consistency that can be seen in Commonwealth cemeteries. Different visions of a Russian past often coexist and even overlap with one another. 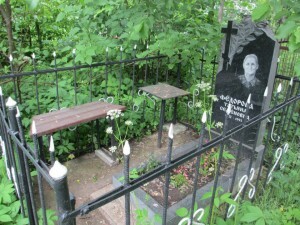 At Piskarevskoe, to the rear of the cemetery, are a number of graves that stand individually in a semi-wooden area. These are the relatives and survivors of the Blockade who have in turn been buried. Their tombstones, however, contain the individual’s name, portrait, and an Orthodox cross. Not only does this breach the anonymity of the cemetery, but it also expresses a non-secular vision of the afterlife. 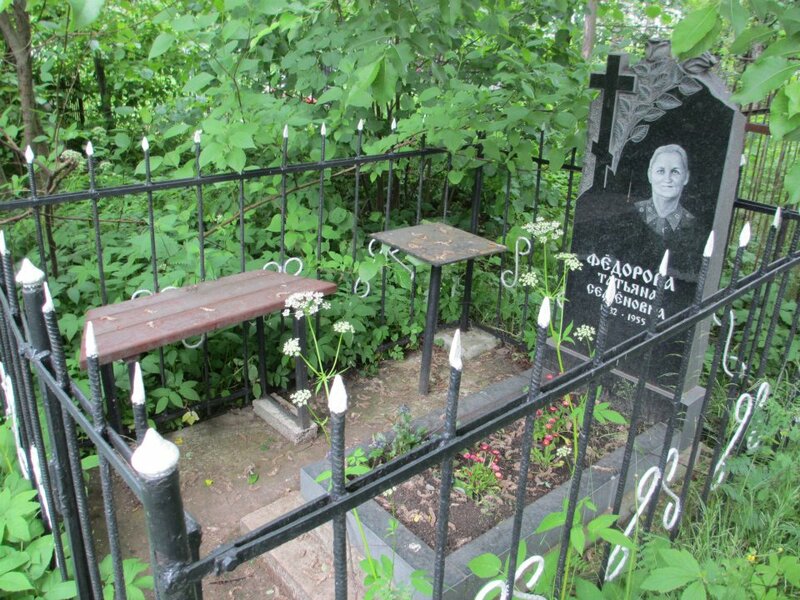 The graves, moreover, are gated and accompanied by a bench; this recalls the Russian practice of visiting deceased relatives on significant occasions and holding private vigil beside their resting place. The woman in Figure 3, for example, is simultaneously a survivor of the Blockade, an inhabitant of a civic cemetery, and the expression of a vision of Russia that may fit uncomfortably with her Soviet experiences (see figure 3). And while this may not have been a contradiction for her, it nevertheless illustrates the coexistence and ambiguous message that exists in Russia’s memorial past. Russian memorialization is also idiosyncratic when one considers the differences between Moscow and St. Petersburg. Piskarevskoe, in many ways, is an expression of regional memory for those who experienced the Blockade. It, and a number of other memorials, such as Victory Park and the Fields of Mars, differs greatly from memorials in Moscow. Victory Park, for example, is a large green space where Russians tend to relax, eat ice cream, and play chess on park benches. Memorialization in this space, besides its name, is limited to some modest statues, including that of Marshal Zhukov, a prominent Soviet general. The Fields of Mars is much the same way. Once a military parade ground for the Tsars, the Fields of Mars is now a park with a modest memorial placed at its centre. The memorial consists of an enclosed area with seating around an Eternal Flame, the symbol of the Soviet victory in 1945. The overall message is one of modest contemplation and public space, a message that speaks more to solemn tragedy than to unabashed heroism. Another interesting contrast to Moscow is the Cathedral of the Spilled Blood, a memorial cathedral dedicated to Tsar Alexander the II who was assassinated in 1881. On the side of the cathedral is a plaque marking damage that was done to the building during the Siege of Leningrad. In addition to the death of a Tsar, therefore, the cathedral stands as part of a regional memory of the siege’s constant shelling. Few commemorations in Moscow seem to be this layered or ambiguous. Rather, in terms of Second World War monuments, Moscow is deliberate and straightforward. The Tomb of the Unknown Soldier, for example, stationed just outside of Red Square and beside the Kremlin Wall, rejects the contemplative and park-like nature of St. Petersburg’s memorial spaces. 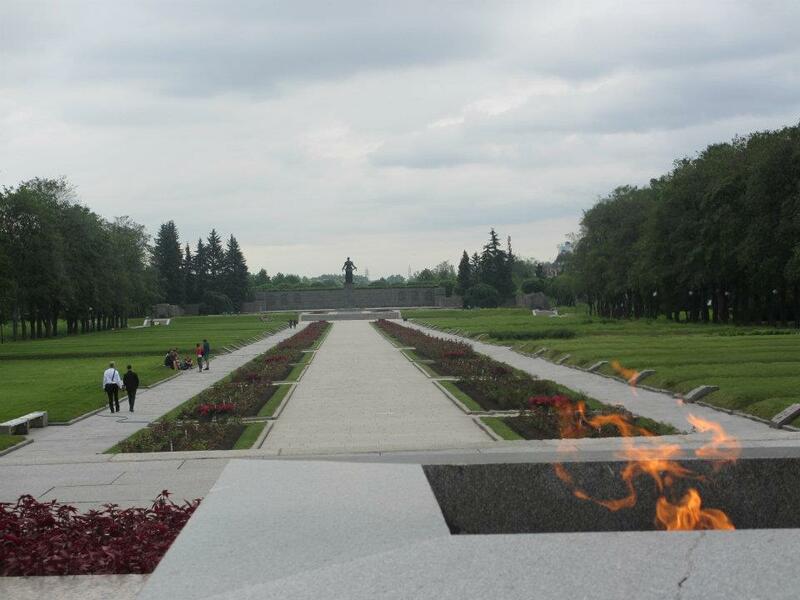 This monument is stationed by guards who protect the Eternal Flame and reinforce the message of the entombed, unknown body: victory, duty, and honour, the characteristics of a good army soldier. 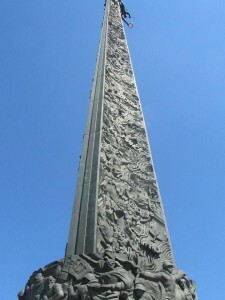 The commemorative column at Victory Park in Moscow. Another memorial that is equally unambiguous is Moscow’s version of Victory Park. Unlike St. Petersburg, where the statue arrangement is quite modest, the memorialization in Moscow’s Victory Park is definitive and clear. 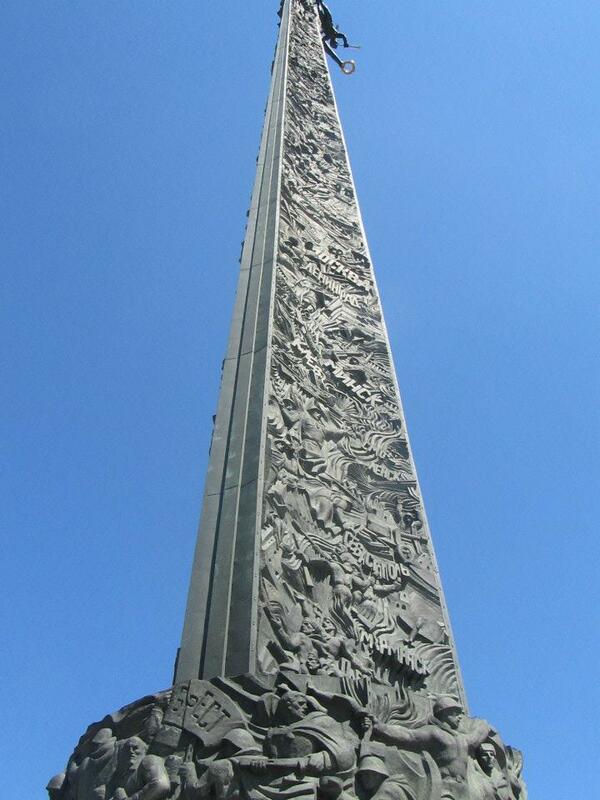 Standing at the centre of the park, in addition to an Eternal Flame and a rather large colonnade, is a 141m column dedicated to the 1945 victory. Here we see an intricate mosaic describing the victory including the carved-out names of various Hero Cities. In addition to the column, moreover, there is a statue of St. George, the patron saint of Moscow, slaying the fascist dragon with his spear. The overall message of this ostentatious display is direct and unquestionable – “after 26 million dead, we won the war.” Unlike memorialization in St. Petersburg, there is no room for an alternate message. Public memorialization in Russia, therefore, is divided along a number of lines. Not only are there regional differences in terms of commemorating the experience of war, but there are also philosophical divisions that correspond to the various traditions in Russia’s past. The overlap of these traditions can been seen through memorializations like the Cathedral of the Spilled Blood, a dedication to Tsarist Russia, but also a stark reminder of the damage of the Blockade. Commemorative messages, therefore, can also coexist, much like the individual graves of survivors and relatives at Piskarevskoe Cemetery. This, however, differs greatly from memorialization in Western Europe where, for the most part, there is a uniform and consistent message in terms of the Canadian experience of war. As a result of Russia’s past, as well as the political and economic uncertainty of its future, memorialization will continue to be a space of contestation and control for many years to come. Kirschenbaum, Lisa. The Legacy of the Siege of the Leningrad, 1941-1995: Myths, Memories, and Monuments. New York: Cambridge University Press, 2006. Tumarkin, Nina. The Living and the Dead: The Rise and Fall of the Cult of World War II. New York: Basic Books, 1994. Note: Lisa Kirschenbaum elaborations on this idea in her work, The Legacy of the Siege of Leningrad. See, Lisa Kirschenbaum, The Legacy of the Siege of Leningrad, 1941-1995: Myths, Memories, and Monuments (New York: Cambridge University Press, 2006).